Symmetry permeates nature, from the radial symmetry of flowers to the left-right symmetry of the human body. As such, it provides a natural way of classifying objects by grouping those that share the same symmetry. This is particularly useful for describing transitions between phases of matter. For example, liquid and gas phases have translational symmetry, meaning the arrangement of molecules doesn’t change regardless of the direction from which they are observed. On the other hand, the density of atoms in a solid phase is not continuously the same — thus translational symmetry is broken. In quantum mechanics, symmetry describes more than just the patterns that matter takes — it is used to classify the nature of quantum states. These states can be entangled, exhibiting peculiar connections that cannot be explained without the use of quantum physics. For some entangled states, the symmetry of these connections can offer a kind of protection against disruptions. Here, the word protection indicates that the system is robust against non-symmetry breaking changes. Like an island in the middle of an ocean, there is not a direct road leading to a symmetry-protected phase or state. This means that the only way to access the state is to change the symmetry itself. Physicists are interested in exploring these classes of protected states because building a useful quantum device requires its building blocks to be robust against outside disturbances that may interfere with device operations. 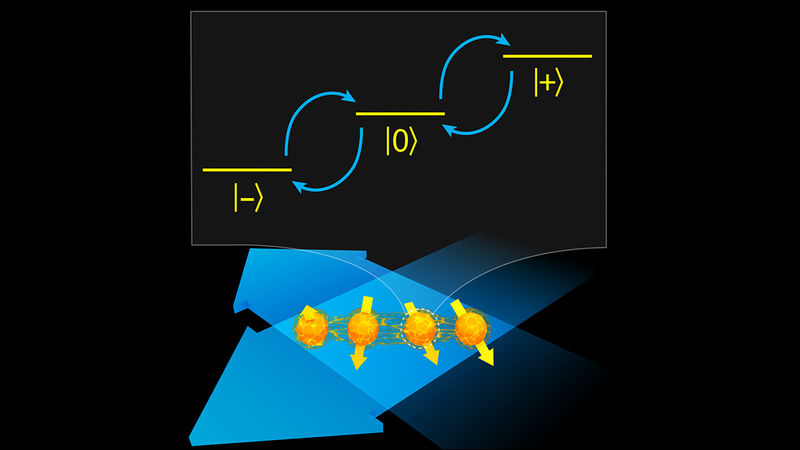 Recently, JQI researchers under the direction of Christopher Monroe have used trapped atomic ions to construct a system that could potentially support a type of symmetry-protected quantum state. For this research they used a three-state system, called a qutrit, and demonstrated a proof-of-principle experiment for manipulating and controlling multiple qutrits. The result appeared in Physical Review X, an online open-access journal, and is the first demonstration of using multiple interacting qutrits for doing quantum information operations and quantum simulation of the behavior of real materials. To date, almost all of the work in quantum information science has focused on manipulating "qubits," or so-called spin-1/2 particles that consist of just two energy levels. In quantum mechanics, multilevel systems are analogous to the concept of "spin," where the number of energy levels corresponds to the number of possible states of spin. This group has used ion spins to explore a variety of topics, such as the physics of quantum magnetism and the transmission speed of quantum information across a spin-crystal. Increasingly, there is interest in moving beyond spin-½ to control and simulations of higher order spin systems, where the laws of symmetry can be radically altered. “One complication of spin-1 materials is that the added complexity of the levels often makes these systems much more difficult to model or understand. Thus, performing experiments in these higher [spin] dimensional systems may yield insight into difficult-to-calculate problems, and also give theorists some guidance on modeling such systems, ” explains Jake Smith, a graduate student in Monroe’s lab and author on the paper. To engineer a spin-1 system, the researchers electromagnetically trapped a linear crystal of atomic ytterbium (Yb) ions, each atom a few micrometers from the next. Using a magnetic field, internal states of each ion are tailored to represent a qutrit, with a (+) state, (-) state and (0) state denoting the three available energy levels (see figure). With two ions, the team demonstrated the basic techniques necessary for quantum simulation: preparing initial states (placing the ions in certain internal states), observing the state of the system after some evolution, and verifying that the ions are entangled, here with 86% fidelity (fidelity is a measure of how much the experimentally realized state matches the theoretical target state). To prepare the system in certain initial states, the team first lowers the system into its ground state, the lowest energy state in the presence of a large effective magnetic field. The different available spin chain configurations at a particular magnetic field value correspond to different energies. They observed how the spin chain reacted or evolved as the amplitude of the magnetic field was lowered. Changing the fields that the ions spins are exposed to causes the spins to readjust in order to remain in the lowest energy configuration. By adjusting the parameters (here laser amplitudes and frequencies) the team can open up and follow pathways between different energy levels. This is mostly true, but for some target states a simple trajectory that doesn’t break symmetries or pass through a phase transition does not exist. For instance, when the team added a third ion, they could not smoothly guide the system into its ground state, indicating the possible existence of a state with some additional symmetry protections. “This result is a step towards investigating quantum phases that have special properties based on the symmetries of the system,” says Smith. Employing these sorts of topological phases may be a way to improve coherence times when doing quantum computation, even in the face of environmental disruptions. Coherence time is how long a state retains its quantum nature. Quantum systems are very sensitive to outside disturbances, and doing useful computation requires maintaining this quantum nature for longer than the time it takes to perform a particular calculation. Monroe explains, "These symmetry-protected states may be the only way to build a large-scale stable quantum computer in many physical systems, especially in the solid-state. With the exquisite control afforded atomic systems such as trapped ions demonstrated here, we hope to study and control how these very subtle symmetry effects might be used for quantum computing, and help guide their implementation in any platform."